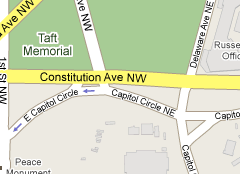 We have reports coming in of gunfire near the Capitol. There has been a significant police response, and we’ve seen tweets that suggest that Constitution is closed at Delaware street headed west. Breaking News On suggests that a 35-year old male is headed to the hospital, and WUSA-TV has reported that this was a police-involved shooting. Update 1: WJLA has the first to print story: A 35-year old male was shot by Capitol Police around 5:15pm, and the all-clear was given at 5:35pm. The person shot attempted to run the barricade at the parking area, but was unsuccessful, which is when the gunfire happened. Update 2: Constitutition Ave is now shuttered from 1st Street NW to 1st Street NE and will probably remain that way for some time while the crime scene is processed. Update 3: NBC Washington has Images from the Scene today.